Wicklow - PetPorte smart flap® Cat Flap Tunnel Extension - White. Optional tunnel extension for petsafe petporte smart flap. Compatible with the Petporte Smart Flap® Microchip Cat Flap. Door or wall too deep for your cat flap?. Extension lead for petsafe petporte smart flap microchip pet door. Extend your adaptor to reach from your wall to your cat flap. This extension lead is compatible with the Microchip Petporte Smart Flap®. SureFlap Microchip Cat Flap Connect and Internet Hub. DualScan™ technology lets you choose which of your cats are allowed outside. The cat flap is battery powered and requires 4 x AA batteries (not included) which will last up to six months with normal use. DualScan™ technology lets you choose which of your cats are allowed outside. The cat flap is battery powered and requires 4 x AA batteries (not included) which will last up to six months with normal use. Reads your cat's microchip to allow entry to your home, without the need for a collar Wall-mount and door-mount compatible; fits standard, wooden, PVC, metal, glass and brick doors and walls Helps keep out unwanted cats Works with UK and EU standard 15-digit microchips and can be programmed for up to 25 cats Optional night mode to keep your cat in at night Petsafe Microchip Petporte Cat Flap White Welcome to our Shop! Each tunnel, when stacked . Accessories Dog & Cat Doors Dog & Cat Door Accessories. Each tunnel, when stacked. For More Information. 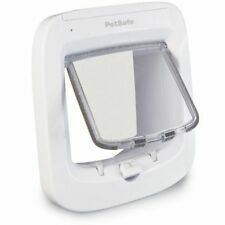 Für Staywell Petporte Microchip Katzenklappe (MTD-40826). Marke Staywell. Professionelle Beratung durch unsere Experten. Beste Beratung vom Fachpersonal. Für Ihre Sicherheit. Farbe: braun. Nur Neuware. Pet Microchip Cat Sureflap Smart Chip Reader Identification Door Cat Flap Works with your cat's existing microchip to keep out intruder cats and wildlifeCompatible with 9, 10 and 15 digit microchipsNo collar or tag is required to operate the SureFlap, which can get lost or snaggedRuns off 4 AA batteries which last up to a year with normal useIncludes 4-way manual lock for controlled entry and exit Sureflap Microchip Cat Flap The SureFlap Microchip Cat Flap identifies your cat by using its existing unique identification microchip, unlocking only for your cat and leaving the neighbour's cat at the door. There is no need for a collar and tag to operate the SureFlap, which can sometimes get lost or snagged. 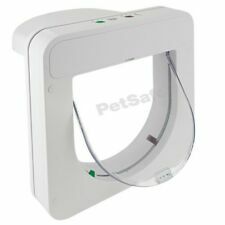 The SureFlap is a selective entry cat flap - it prevents unwanted cats and animals entering the h.
Reads your cat's microchip to keep intruder animals out. DualScan technology lets you set exit permissions for each cat. Flap opening: W142 x H120mm. Insights allow you to gain a greater understanding of your cat, with graphs containing information on how often they are coming and going and how long they have spent outside. 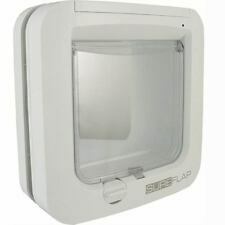 Sureflap Microchip Cat Dog Pet Door Flap Connect Internet Hub Smart App White. The cat flap is battery powered and requires 4 x AA batteries (not included) which will last up to six months with normal use. PETPORTE SMART FLAP This extension tunnel is compatible with the Petporte smart flap. The PetSafe Petporte tunnel extension provides a secure, accurate fit when installing your cat flap into thicker doors and walls. PETPORTE SMART FLAP This extension tunnel is compatible with the Petporte smart flap. - THICK WALLS Each Tunnel Extension adds 40 mm, making installing your Petporte cat flap in thicker doors and walls quick and easy. PETPORTE SMART FLAP This extension tunnel is compatible with the Petporte smart flap. THICK WALLS Each Tunnel Extension adds 40 mm, making installing your Petporte cat flap in thicker doors and walls quick and easy.